Is there any meat still to be found in the premise of the mythical ‘zombie apocalypse’ which purveyors of horror have been warning us of since the dawn of cinema? Well according to the Cuban gut-muncher Juan of the Dead, yes – plenty! Written and directed with striking sparseness by Argentinian film-maker Alejandro Brugués and starring Alexis Dias de Villegas, Jorge Molina and Andrea Duro, this film is a gorily striking take on one of horror’s favourite subjects. Havana is over-run with zombies. Though the official media has tried to pass off the initially isolated incidents involving ravenous reanimated corpses as being perpetrated by dissidents supported by the American government, it is obvious to those still uninfected that there is something deeper at the root of the problem. One such person is Juan (Dias de Villegas) who, with his best pal Lázaro (Molina) and what’s left of their respective families, forms a vigilante group ‘Juan of the Dead’, that will kill zombies for a pre-agreed fee. As the months pass and it becomes obvious that they are fighting a loosing battle against the increasing hordes of flesh-eaters, the gang must take decisions that will effect their future forever. First ignore the fact that Juan of the Dead‘s tenuous premise is in places hard to follow. 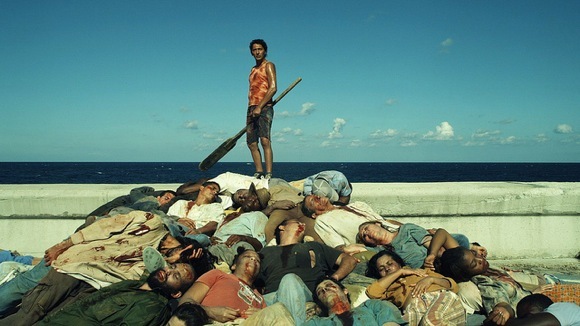 Littered with frequent allusions to Cuba’s political and social history as reasons behind the Zombie infestation, the viewer is left feeling that the film’s satirical references will likely mean more to Cuban natives than to the larger international audience. If instead you approach the film as a dryly humorous take on the zombie genre, immersing yourself in the ninety-five minutes of no-holds-barred, comic-book violence, you’ll likely come away feeling slightly nauseous yet with a smile on your face, which is the effect all good horror movies should have on the viewer. The best thing is the film’s look, and the predicaments our hapless heroes constantly find themselves in, yet at the last moment manage to escape. The visually arresting bleached browns of Havana form a perfect backdrop for the liberal dousings of blood and severed limbs, whilst the plethora of set-piece deaths appear fresh in their originality. Juan of the Dead should be approached like life, by forgetting the politics and just going along for the ride.